Made from the same materials that are used for our festival blankets. 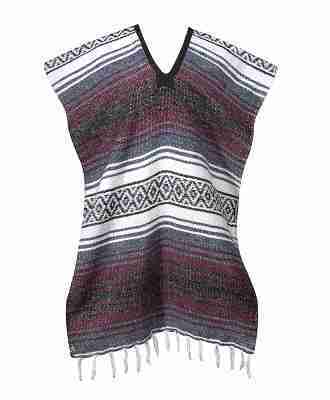 For those chilly days or nights, put on this classic Mexican falsa poncho. It is perfect for staying warm while keeping your arms and hands completely free to chop wood, rake the backyard, or just take a walk in the woods. The perfect active wear choice when there’s a chill in the air and you've got things to do. One size fits most. measures approximately 26" W x 36" L.
Comes in assorted colors combinations. Most of them are 3 color - grey, white, and a 3rd color. You can put your requests in the comments section, and we'll do our best.